Happy New Year! Happy Holy Name! The Feast of the Holy Name of Jesus is the day on the church calendar when we celebrate Jesus’ naming day, his christening if you’ll pardon the pun. Luke 2:21 says, “It was time to circumcise the child; and he was called Jesus, the name given by the angel before he was conceived in the womb” (NRS). Between Christmas—when we celebrate his birth—and Epiphany—when we celebrate his gift to the wise men, the first Gentile believers—between those two events in the church calendar, we celebrate Jesus’ initiation. Furthermore, tomorrow is not just the celebration of our initiation through baptism. According to Galatians, it’s the day of our investiture. Our graduation. It’s the day we don cap and gown and publically declare who we are. It’s the day we sign our names to our New Year’s resolutions. And that’s a whole other ball of wax. God the Father may have carried us this far, to his appointed day, but as we consider our hopes for the new year, what assurance do we have that we’ll be able to carry them out? And how will we know that it’s his Spirit leading us and not some false melody of our own making? Miss Davis knew what she was doing. She chose arrangements that were challenging, but not too hard for the least musical of us (me). She focused on our technique, helping us reform the circle of our gestures to mellow and lengthen our bells’ reverberations. When we needed to learn on our own notes, she made us count, count, count out loud to keep each of us honest. She urged us to hum the melody even when our own notes were resting so we could hear the whole piece. She even conducted while simultaneously playing two bass bells—the heavy ones—herself. 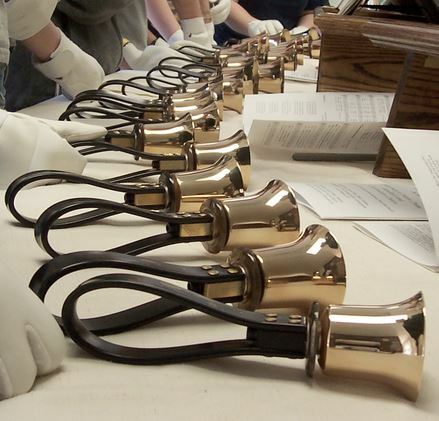 That first year, we memorized the “Carol of the Bells” and rang it antiphonally as we processed into chapel. We sounded good and I fell in love with the collaboration and solidarity of many of us creating one music together. So, of course, when I got to college, I joined the college bell choir. That conductor made us stand in reverse with the high notes at the left end and the low notes at the right end because she couldn’t conduct without it looking like a piano from her side of the tables. It didn’t help that rehearsal was scheduled right after my anatomy lab. I’d leave my lab coat in the science building, but the clothes underneath still reeked of formaldehyde and decomposing dogfish-shark. My fellow ringers needed olfactory space, which interfered with our ability to close up the auditory space. The final straw was the pieces our conductor gave us to play. Her husband was “composer-in-residence” at the college and he seemed to be exploring a modern, scientific, cacophonous sound. In those pieces, the tune was often buried. Or hiding. Or missing. I couldn’t find it. And no matter how often she shouted, “Hear the music! You’ve got to hear the music!” I could not. When was the last time you were “taken in” by your participation in something larger than yourself? What desire did it satisfy? What depth did it summon from you or call you into? You can find Hear the Music, part 2: Wear the Robe here.